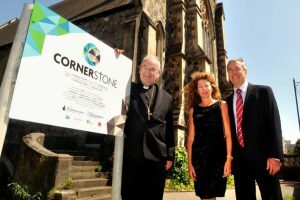 The Cornerstone project which aims to transform Cardiff’s Ebenezer Chapel in Charles Street into a community, heritage and conference centre, is celebrating after receiving a £150,000 charitable donation from The Jane Hodge Foundation. In April, the project, led by the Archdiocese of Cardiff which aims to revitalise and conserve the vacant Grade II listed 1855 chapel, moved a step closer to receiving a £1m grant from the Heritage Lottery Fund. The HLF awarded Cornerstone an initial £80,000 grant to develop plans. If successful the project, which is being developed with a range of community partners including RNIB Cymru, will receive a further £1.2m from the HLF. The Jane Hodge Foundation, founded by the late Welsh financier Sir Julian Hodge in honour of his mother Jane, supports a range of causes and projects in particular medical research, education and the advancement of religion. The Foundation’s board of trustees is headed by Jonathan Hodge, the son of Sir Julian, and deputy chairman of Julian Hodge Bank. Jonathan Hodge said: “We are very excited to be able to support this very important project. “Cornerstone commended itself to our trustees because it combines the essential refurbishment of a building that is important to the history, architecture and culture of Wales, together with the provision of beneficial facilities to a cross-section of the local community. Located opposite Cardiff Metropolitan Cathedral of St David, the building was purchased by the Catholic Archdiocese of Cardiff in May 2012. Cornerstone is scheduled to open in Autumn 2016. The Most Revd. George Stack, Archbishop of Cardiff said: “We are very grateful to the Jane Hodge Foundation for this magnificent and most welcome donation. Cornerstone will house a new café and a new conference facility, as well as continuing to provide a space for community groups. The project aims to create six new full time and twenty part-time jobs and as part of a partnership with local charities, employment and training opportunities will be made available.